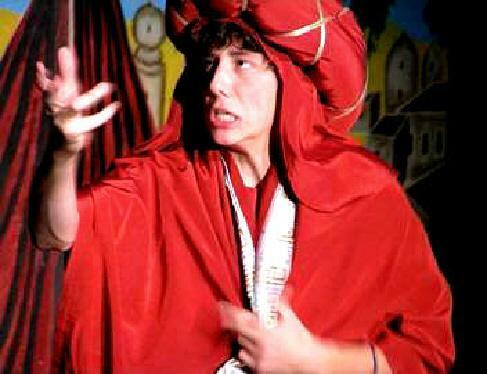 ArtReach's 'The Emperor's New Clothes' is a bestselling comedy for kids. This fun script is full of laughs, magic tricks and audience participation! 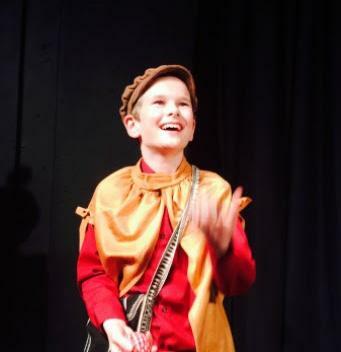 "We were so thrilled with the play, Emperor's New Clothes, we can't wait to do another one of ArtReach's plays!" "Youre going to laugh! Its a good show for young children because theres a lot of action  it moves along quickly  and there are things to laugh at, and its fun!" 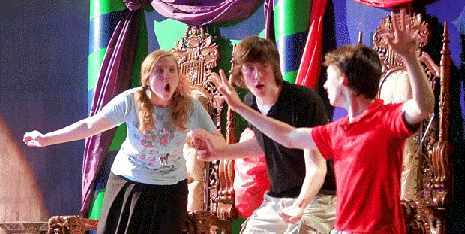 "Emperor's New Clothes is the sort of hip, jazzy, irreverent show that could get students hooked on theater forever." Teachers, The Emperor's New Clothes is written just for you and your students. It is faithful to the original Hans Christian Andersen fairy tale with audience participation and lots of fun for everyone! "We loved the humor of the script. A good time was had by all!" 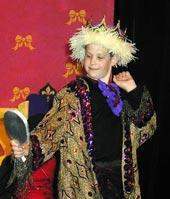 "Actors for Children Theatre of Flatwoods KY would like to say THANK YOU to ArtReach Children's Theatre Plays for allowing us to produce "The Emperor's New Clothes" in our inaugural tour in Spring 2013." "A hilarious romp that includes several fun magic tricks, juggling and audience participation. Ideal for Grades K-5." 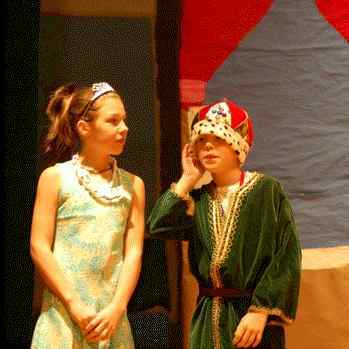 "Stewarton Youth Theatre's production of The Emperor's New Clothes by By Kathryn Schultz Miller made a terrific finale to an evening of one-act plays!" 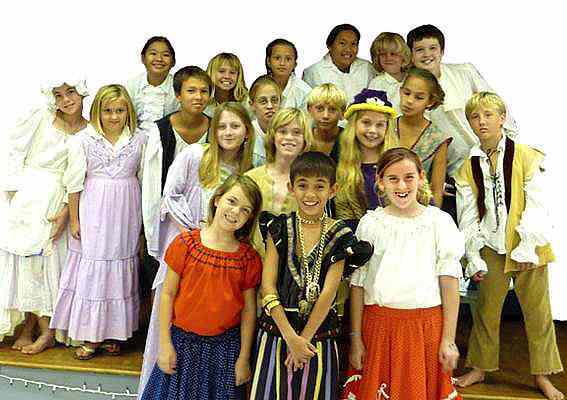 "This is my second year coaching 5-8th drama club. I purchased The Emperor's New Clothes from your company last year and it was a huge success." "I bought the Emperors New Clothes script last year and loved it! Thanks!" "Comments from the audience on the way out: "That was the best show you've done yet." "Wonderful! We laughed so hard!" Hilarious Comedy Script! Just for Kids! 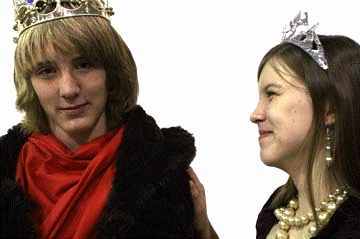 Teachers, ArtReach's School Play, The Emperor's New Clothes, is just what you are looking for. Lots of fun and laughs for a large cast of kids! 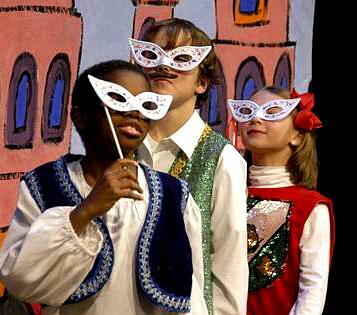 Easy to stage, simple, kid-friendly dialogue make this a sure bet for your next School Play! Perfect for a Large Cast of Students! 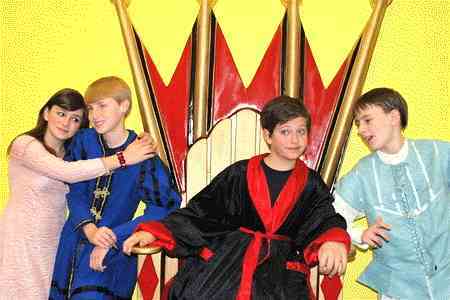 "We just had our performance of Emperor's New Clothes this past weekend. It was a riot! And the children had a blast doing it! bestselling, favorite children's plays. This School Play is packed with action, laughs, magic tricks! "You'll Laugh Your Socks Off!" Lots of laughs are in store when Peter, the mischievous tailor, comes up with a sure-fire get rich quick scheme to embarrass the vain Emperor and make off with a basket of jewels and gold. "I worked with 11 3rd, 4th,and 5th graders. With 8 (1 and a half hour) weekly rehearsals we pulled it together. 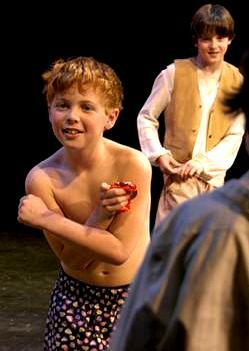 The parents were very pleased with The Emperor's New Clothes and I was too. I will certainly be back to get our next script. Thank you!!!!!" Peter Uses His Wit to Make Magic Clothes! 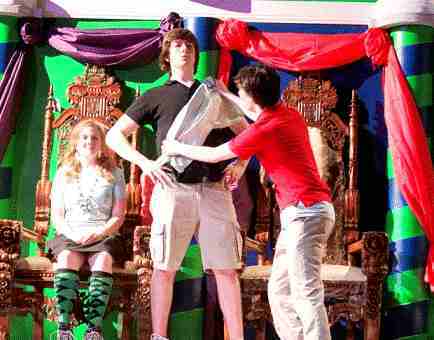 Peter convinces the court he can make magic clothes. Only those who are very smart can see the clothes, he tells them. Everyone pretends they can see the clothes until... Someone in the audience shouts out the truth! Big Laughs for Small Kids! 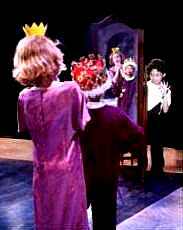 Just for Kids: Speeches and vocabulary are appropriate for child performers ages 6 - 12. Simple dialogue, easy for kids to memorize! A Flexible Cast of 37 or more students: (Doubling and extras possible.) Every role has a name and spoken lines (or significant action). 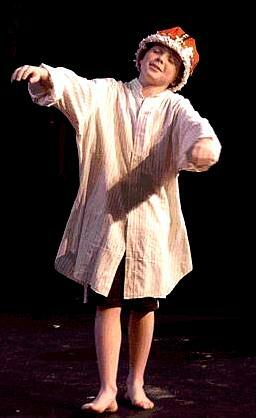 Peter (Or if you cast a girl, Petra) can be played by up to 6 children (boys or girls) to ensure that not one child is the "star". 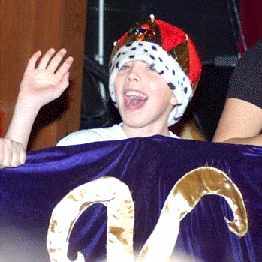 There can also be multiple Emperors and Empresses. 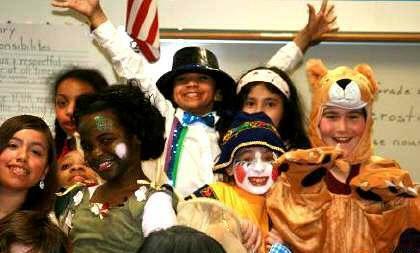 Easy costumes and scenery: Many suggestions on how to create or find what you need to make a great looking play production without breaking your budget! "Some of our most disabled students are having the most fun! We are only in early stages of rehearsal but it brings tears to my eyes to see the joy the kids are experiencing with this play." Fun comedy makes this script a great choice for Middle Schools and Junior High, Teenagers! Great for family entertainment! 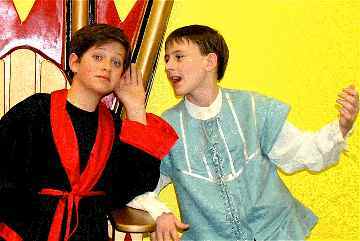 "We toured Emperor's New Clothes to 6 schools, community centers and libraries in the tri-state area of KY-OH-WV and performed for 1,210 audience members!" "Wonderful! We Laughed So Hard!" "Emperor's New Clothes was a perfect fit for our workshop goals. A true educational experience and community effort, the production offered many opportunities for the kids to learn and grow." "Your plays are fantastic! Good writing is not always easy to find for the elementary/jr.high crowd - so I really appreciate your work." 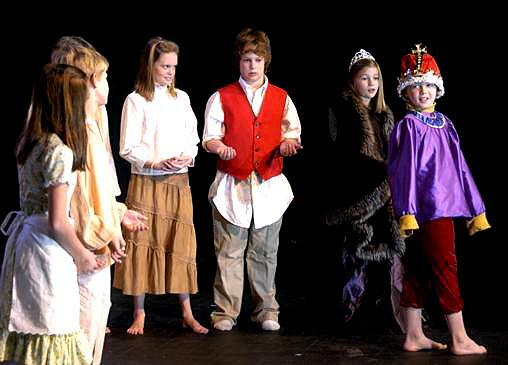 Large Cast Play for Elementary, Primary Schools and Middle Schools. Recommended for Adult Actors, Theatres, Touring to Schools.